Cast of “A Bright New Boise” by Loudmouth Collective; photo by Justin D. Gallo Photography. Perhaps no other culture outside the contemporary United States has had such a cleft between its belief in freedom while continually finding itself tied to the past. As Americans, we believe ourselves free to act unencumbered by influences like religion, economic forces, and even the simple expectations of others. Yet the more we believe in freedom, the more strongly we find ourselves influenced by forces beyond our control. Under the direction of Natalie Novacek, Loudmouth Collective’s production of playwright Samuel D. Hunter’s A Bright New Boise tells a story of fresh starts. In a bleak big-box retail break room, we see five characters attempt personal renewal. What they find instead is that the truth rears its head with little heed to our needs. 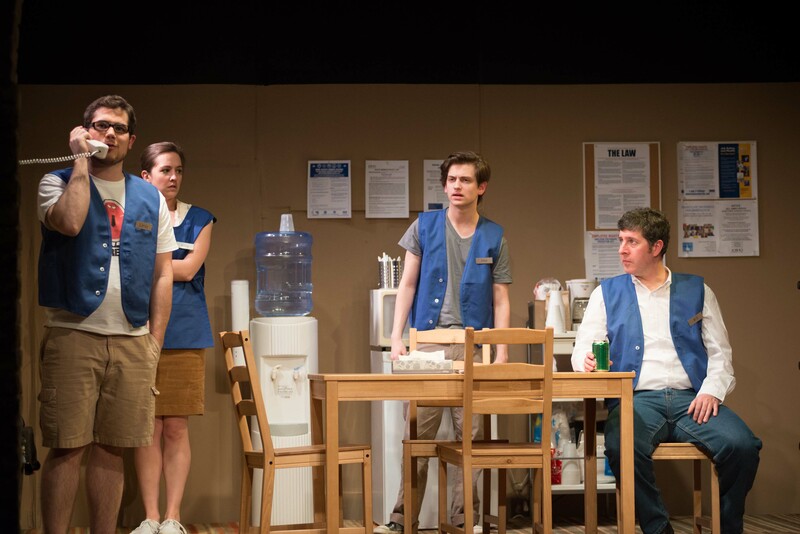 As Will, actor Adam Whisner says, “I still believe in God”—a simple statement, but as with all five characters in this play, Will does not control the story behind the cliché. He has come to Boise from “up north” to reconnect with his long-lost son Alex (Spencer Harrison Levin), who works part-time at a suburban Hobby Lobby in all its smock-and-nametag terribleness. Pauline (Karen Wiese-Thompson) manages the store with a sharp tongue, while employees Leroy (Zach Garcia) and Anna (Anna Hickey) imagine better places. Sound, lighting, and blocking are all understated (by Katharine Horowitz, Sarah Brandner and Megan Winter, and Reena Novotnak, respectively), matching the corporate break room setting. Yet the dreams for all the characters are outsized in the American style: Will dreams of Rapture, Alex of music composition, Anna of writing, Leroy of conceptual art, and Pauline of corporate excellence. But the bigger the dream, the smaller today seems. For this reviewer, Loudmouth Collective’s production of A Bright New Boise put large-scale efforts such as those at the Guthrie to shame. The acting is intimate and believable, the script builds thematic complexity toward unexpected plot twists, and no part of the production does anything other than tell the story more fully. This play exemplifies the symbol of the theater: the masks of comedy and tragedy (Thalia and Melpomene, respectively, for trivia buffs). Reader, you must see this play.